The holiday season has officially begun. How did that happen?! LOL I feel like it was just yesterday that I brought Miles home from the hospital and now we are only a few weeks away from Christmas. Sales are in full swing, though I have definitely become more of an online shopper over the years and prefer to spend the rest of the holiday season enjoying sights and going places to experience as much as I can. Even though Miles sleeps most of the day right now, I still can't wait to take him a few different places this month to get in the festive spirit. And yes, we may even take him to see Santa though it's 100% for us at this point rather than him. Ha! December is always the time to bring out traditional festive outfits, but I find that many times I only get to wear those pieces during the holidays. So I love finding a dress that works for the holiday season as well as the rest of the year. This leopard print piece struck that perfect balance and seemed so versatile for fall, winter, spring and early summer. For a party look, I would probably throw on a red lip or smokey eye, clutch and either pumps or boots to dress it up. Though for day, I would wear it with ankle boots, flats or even sneakers, and then throw on a leather jacket or long black cardigan to keep it casual. The holidays are a great time to experiment with fun or festive pieces, but if you are trying to stretch your budget it makes sense to buy a print that isn't appropriate only in December. 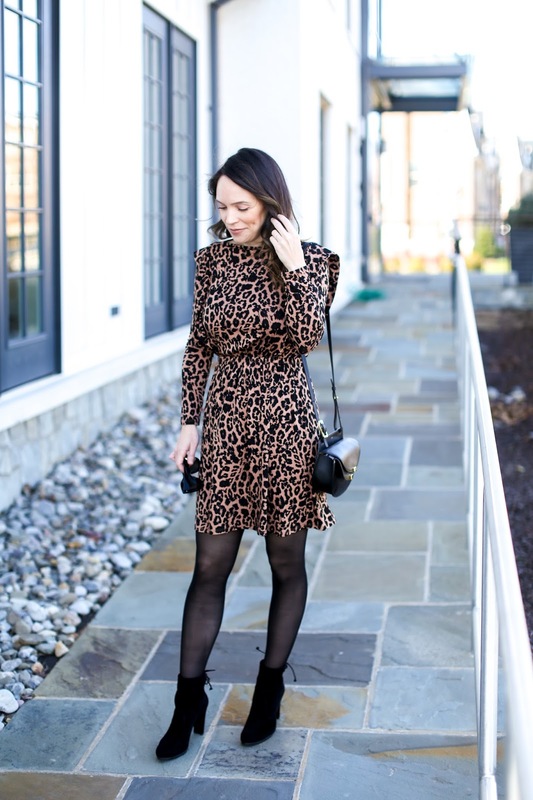 A fun brocade pattern, animal print or even a bright plaid print would look amazing for holiday events but would also seamlessly transition into the rest of the winter season. For more printed dress options, scroll through the widget below. You look FANTASTIC!!! And not fantastic “for just having a baby”; fantastic with no caveat. Truly!